Colorful Impressions: The Printmaking Revolution in Eighteenth-Century France, National Gallery of Art, Washington, 2003-2004, no. 77, as Mgr. 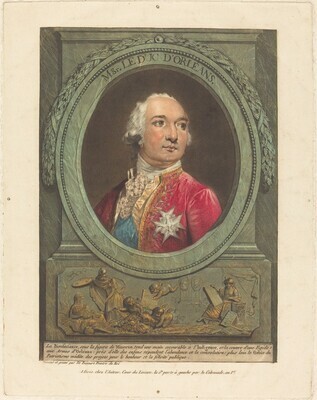 Le Duc d'Orléans. Fenaille, Maurice. L'Oeuvre grave de P.L. Debucourt (1755-1832). Paris: Librairie Damascene Morgand, 1899. Colorful Impressions: The Printmaking Revolution in Eighteenth-Century France. Exh. cat. National Gallery of Art, Washington, 2003-2004: no. 77.